The Democratic-led US House of Representatives has failed in a bid to overturn a presidential veto on an expanded child health insurance plan. The House voted 273 to 156 in favour of the bill, 13 short of the two-thirds majority needed to override a veto. The vetoed bill proposed higher tobacco taxes to provide an extra $35bn (£17bn) to insure some 10 million children. Mr Bush argued it took the programme beyond its original purpose of insuring children from low-income families. The State Children's Health Insurance Programme (SCHIP) currently subsidises health care for some 6.6 million people, most of them children. It is directed at families who earn too much to qualify for the Medicaid programme for the poor but cannot afford private health insurance cover. Although Thursday's vote in the House was close, House Democrats failed to persuade enough of their Republican counterparts to back the bill for the veto to be overturned. Rahm Emanuel, a Democratic congressman from Illinois, vowed that the party would not give up on the proposed expansion. "In the coming days, Democrats will not back down and we will insist on providing health care to these 10 million children," he is quoted by Reuters news agency as saying. Democratic Senate Majority Leader Harry Reid said Republicans who chose to support Mr Bush's "heartless veto should be embarrassed that he chose to stand in the way of improving the lives of millions of America's poorest children". Republican Senate Minority Leader Mitch McConnell responded by accusing the Democrats of pushing a bill they knew would be vetoed in order to score political points, at the expense of uninsured children. Eighteen Republican senators joined Democrats last month in passing the bipartisan legislation by a 67-29 vote. Mr Bush said he had used his veto - only the fourth of his presidency - to ensure he had a hand in shaping the bill. He has spoken of reaching a compromise and suggested he may be willing to expand the programme to cover some 500,000 additional children. Three top advisers, including Mike Leavitt, the US health and human services secretary, have been assigned by the White House to try to negotiate a new deal with Congress. 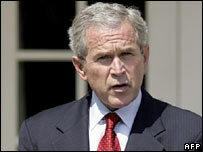 Mr Bush has previously offered a $5bn increase, bringing total spending over five years to $30bn. He argues that expanding its coverage further would encourage people currently covered in the private sector to switch to government coverage - and that the proposal is too costly. Supporters of the bill say the proposed $35bn expansion, paid for by raising federal cigarette tax by 61 cents to $1 a pack, would help give health coverage to an extra 4m children. Mr Bush has previously used his veto twice to block legislation that would have eased restrictions on federally funded stem-cell research and once to halt a bill linking war funding to a timetable for withdrawal of combat troops from Iraq.